Our last morning in Santa Fe had arrived… Jon wasn’t feeling like trying out a new place for breakfast, so we went back to the Plaza Café – our breakfast haunt from the previous morning. Jon had his new usual – the egg white omelet with fruit and toast. And coffee. I ordered something different – the Traditional, with two eggs over medium, ham, toast, hash browns and hot tea. Once again, it was a good meal, with fast and friendly service. 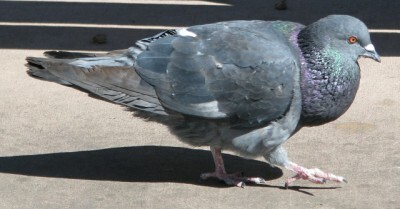 After breakfast, we sat on a bench in the middle of Santa Fe’s plaza and watched the fattest pigeon I have ever seen scrounge for his breakfast. Amusing, but sad to to think that he probably got that way because people feed him lots of unhealthy snacks. Look at this Fat Guy! The Palace of the Governor’s is fascinating. 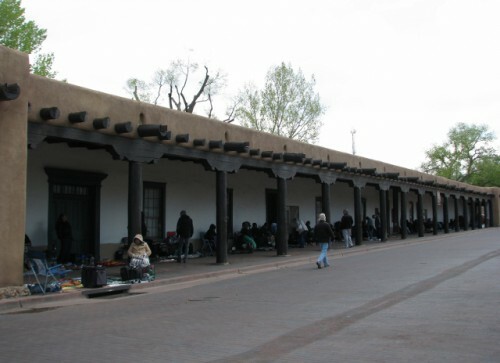 It was built in 1610 by the Spanish – it was the seat of government for the Spanish colony of Nuevo Mexico, which covered present day Texas, Arizona, Utah, Colorado, Nevada, California, and New Mexico. During the Spanish colonial period, the Spanish treated the Native Indians poorly, with a forced labor system that was basically slavery. One tribal leader, Popé, planned and executed a revolt of several of the tribes in the area. He dispatched runners with knotted cords to each of the tribal leaders. The knots were to be untied one each day, and on the day that the last knot was untied, the Indians were to attack the Spanish and drive them from the area in a collaborated revolt. The Spanish caught some of the runners and tortured them to learn the significance of the knots, and as a result the revolt had to happen earlier than planned. However, it was still very successful. They managed to drive the Spanish out of the area for twelve years. During that time they attempted to wipe all Spanish influence from the Palace of the Governor’s, which the Indians had begun using. When New Mexico was annexed as a U.S. territory, the Palace of the Governor’s was used as the first territorial capitol building. It is the oldest continuously occupied public building in the United States. The museum has lots of artifacts from the colonial period when the Spanish were exploring the area and setting up outposts. They have cookware, pottery, lists of supplies etc. 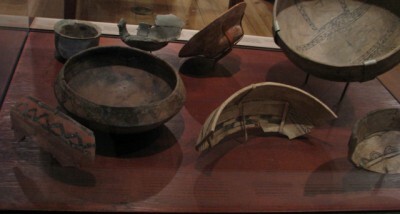 They also display a lot of artifacts that were excavated from the building and its surrounding area when it was renovated. 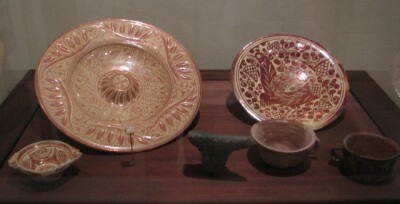 Pottery, ironwork objects, beads from jewelry, religious objects – there was a lot to look at. They also have cutouts in the floor that show the original adobe brick floor – they show where one room has a herringbone pattern, which indicates that the room would have been used for higher status individuals. Next door they showed where the servant class or Indians would have lived or worked, with rooms that had a simple adobe brick floor. It was interesting to see how even back then, there were significant markers showing the distinction between the classes. After checking out the Palace of the Governor’s, we crossed the courtyard and made our way into the New Mexico History Museum (you get both museums with the same admission, even if you don’t have a pass). If you do the museum in the right order, it begins during the same Spanish Colonial period, with overviews of the beginnings of the Spanish mission system, the Pueblo Revolt and the retaking of the areas that were regained by the Indians during the revolt. It also detailed the period after Mexico lost the land to the United States, the expansion into the New Mexico territory by U.S. citizens, and its subsequent frontier and ranching days. New Mexico entered the union in 1912, the 47th state to join. I didn’t realize it was such a late state! There is also an interesting exhibit on the development of the atomic bombs during World War II. The administrative office for the Manhattan Project was in Santa Fe, and the bombs were built in Los Alamos and tested in the New Mexico desert nearby. It was interesting to learn that people who were living and working on the project had to maintain absolute secrecy. They were not allowed to even tell their families where they were – or to send them photos that identified the landscape of New Mexico. Their mail was screened. We also went upstairs to see a modern art photography exhibit, but it just didn’t suit my fancy – too modern and weird for my taste. But it was interesting to see. If you are in Santa Fe – I strongly recommend these two museums. 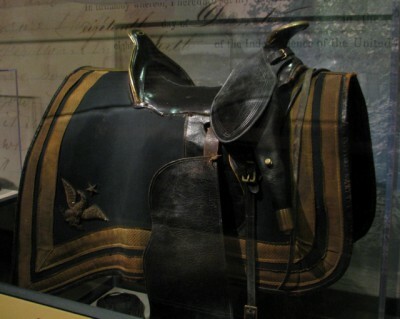 The exhibits are very well done – and you get a fantastic overview of New Mexico history. After we were done at the New Mexico History Museum – it was time to get back on the road to our next destination – Albuquerque! Tonight I’m settling back into life at home. Jon and I got home today after a whirlwind trip down to the Rogue River Valley in Southern Oregon. We had a blast visiting the Oregon Caves, Crater Lake and doing some wine tasting and shopping. I promise to blog about it once I’m all caught up on my Southwest trip. As I contemplate folding laundry, I’m sipping the Tangerine Wheat Beer by Lost Coast Brewery, in Eureka, California. Since we were so close to California on our trip, the stores carried some of the California microbrews that we don’t see at home. I’m a sucker for fruit/wheat beers, and this one piqued my curiosity. On the nose, I pick up lots of tangerine scent, along with a malty smell. So far, so good. On the palate though, I’m disappointed… I can definitely taste the tangerine, but the beer tastes flat, even though it isn’t. There is a bitterness on the finish that overpowers what a fruit and wheat beer is supposed to be. There just isn’t a lot of depth to it, and I keep feeling like it has a stale taste. They do get points for a super-cute label though! I know I can’t like them all, but I really wanted to like this beer. Ah, well, it is still a cold beer on a hot sunny day. Have you ever had any of the Lost Coast Brewery’s lineup? What did you think? After our visit to the Georgia O’Keeffe Museum, we went back to the hotel to chill out and rest for a little while. Jon wanted to go find a record store he was interested in – so we got in the car and headed over. You can tell how much I enjoy record stores when you consider the fact that I had to think just now for several minutes to remember the visit… But I remembered! It was a Hastings music store, which I like more than other record stores because they have books! And this one had chairs! I spent a while perusing the local New Mexico book selections. It was an enjoyable way to spend some time, but I resisted the urge to add more books to my collection – that was hard! After Hastings, we stopped by the grocery store to check out some of the local wine selections. I knew that there are some New Mexico wineries, but we weren’t really going to have time for visit any on our trip – we were focused on the National Parks! We did find two wines that we were interested in though; a red and a white, both from St. Clair Winery in Deming, New Mexico. St. Clair was established in 1984 by two brothers, although the family has had 6 generations involved in wine-making. The red was a Cabernet Sauvignon/Zinfandel blend, with 50% of each, with 12% ABV. It had a garnet red color, not as opaque as your typical Cab or Zin; more like a Pinot Noir. The mouth feel was very light, and the nose was of strawberry and fruit punch. And the taste? Well, it was more like a Concord grape wine, with flavors of strawberry, grape and fruit punch; however, it wasn’t a super-sweet wine. The second day, after wiggling around in the car for a couple of hours, this wine opened up and lost that Concord grape taste. I could actually tell that there was Cab and Zin in the wine… and I liked it much better! The white we chose was a Riesling; it was a nice, semi-sweet wine with flavors of lemon and peach. I liked it better on the first night than the Cab/Zin blend. The wines certainly were different than we are used to, and probably won’t win any fancy awards when pitted against the Napa or Washington wines, but they were good everyday drinking wines that would appeal to many. After the grocery store, we headed back to the hotel to walk to a Spanish tapas restaurant that I wanted to check out. It was right in the Santa Fe historic district, only a few blocks from the hotel. And so we headed over… to find it closed… A victim again of the “Closed on Mondays” curse in Santa Fe! DRAT! So now we didn’t know where we wanted to go, but we didn’t want to drive anywhere, so we wandered around the historic downtown until we stumbled upon the San Francisco Bar and Grill. The menu looked good, with a mix of dishes. The San Francisco Street Bar and Grill was a nice place with plenty of seafood options. They also brewed their own beer – a theme on this trip! 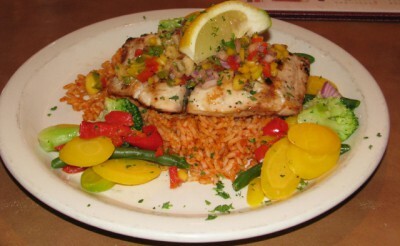 I had the Mahi Mahi with Spanish rice and seasonal vegetables. I paired my meal with the La Cumbre A Slice of Hefen Hefeweizen. Jon had the Ahi Tuna with tomato jam and risotto. His went with the La Cumbre Elevated IPA. The fish was delicious – we were really enjoying it; when a fight broke out. Nope, dear readers, it wasn’t Jon and me fighting. That’s right – up at the bar, two guys, one with a Scottish accent, started yelling at each other. Loudly… Several of the waiters had to run over to serve as bouncers and they threw the Scottish guy out. He was yelling and cursing the whole time down the stairs. Jon had a blast watching! I’m so behind – trying to catch up I swear! I bet this baby raccoon never feels overwhelmed by it all. 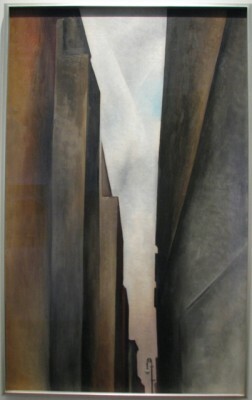 After our wonderful lunch at Tia Sophia’s in Santa Fe, Jon and I went over to the Georgia O’Keeffe Museum. It is a little tough to find, with its entrance tucked into a little side street. Admission is $6 for New Mexico residents and $12 for non-residents. Me Outside of the Georgia O’Keeffe Museum – It Was Still Cold! 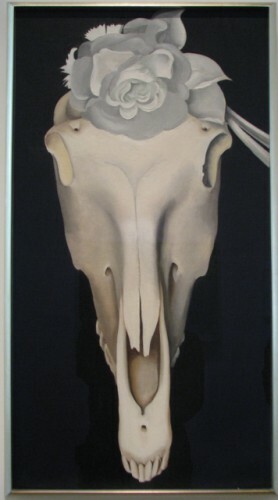 Georgia O’Keeffe was born in 1887 (the same year as my grandfather) in Wisconsin to a dairy farming family. She decided at age 10 that she wanted to be an artist (at that age, I was still dreaming of being a horse racing jockey), so she went to art school at the Art Institute of Chicago. After finishing school, she stopped painting for a period of time, because she wasn’t inspired by the style popular during the time, and spent a couple of years teaching art classes in Amarillo, Texas. In 1916, she was discovered when a friend sent a folio of her work to a prominent gallery owner friend in New York. When she and the gallery owner, Alfred Steiglitz, met a few months later, he offered to pay her expenses for a year in New York so she could focus on her art. Although Steiglitz was married, he and O’Keeffe fell in love, and had an affair for several years until he divorced his wife. Then they married shortly after. Although she said that she was in love with him, they had a very independent relationship, devoting themselves to their own work and living apart for months at a time. 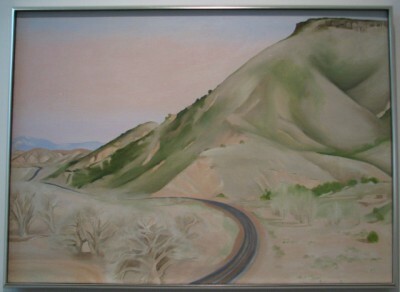 O’Keeffe first visited New Mexico in 1929; she fell in love with the area and was very inspired by the landscape near Taos. She spent part of nearly every year in New Mexico between 1929 and 1949, before finally making her home near Santa Fe in 1949. Steiglitz died in 1946, and she never remarried. She was a prolific artist until the very end of her life – her failing vision caused her to start working in pottery, charcoal and watercolor several years before she died in 1986. A New Mexico Landscape – Beautiful! The galleries were interesting – they had works for the different time periods of her life – New York, Hawaii and of course Santa Fe. The exhibit explained how she spent several months in Hawaii in 1938 on commission to the Dole Pineapple Company; they wanted her to paint pineapple pictures for an advertising campaign. Curiously, although she painted many fruits and flowers during her time in Hawaii, she did not create the requested pineapple paintings until after she has returned to the continental United States. Several of the galleries allowed photography (but sadly not the Hawaii exhibit gallery), so I took some photos of works from different periods in her life; I was impressed by the range of subjects and styles in which she painted. I was a bit surprised by the small size of the museum – they didn’t really have that many of her works. But I guess when you consider that she was very popular when she was alive, and sold a lot of her paintings, it makes sense that there wouldn’t be that many hanging around for a museum exhibit. Overall, I found the museum worth a visit, but don’t expect to spend more than a couple of hours there. And with that, we were on our way to find more adventures! 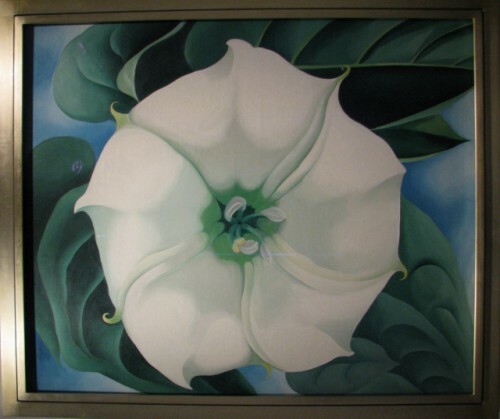 Which is your favorite Georgia O’Keeffe painting? I’m back from a trip to Los Angeles to visit my uncle, but work has been a blur and I’ve been trying my best to catch up on things at home. Laundry, cleaning, all those chores! 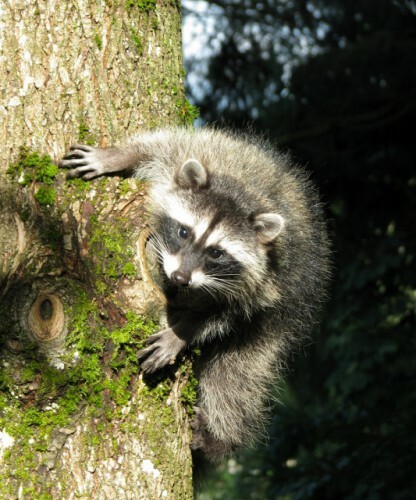 Plus we are still working on the deck… So meanwhile, another baby raccoon to keep you occupied! 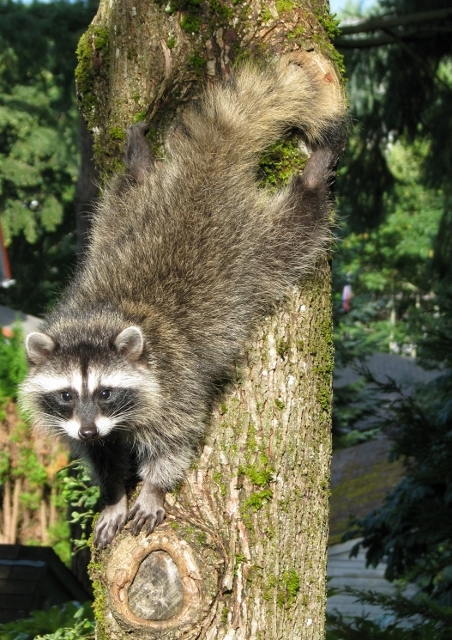 Raccoon Baby in the Tree Next to the Deck – He was Loving Checking Me Out! In my last post on our Southwest road trip, we visited the Loretto Chapel and the Oldest House in the U.S.A. After that we visited the San Miguel Mission. 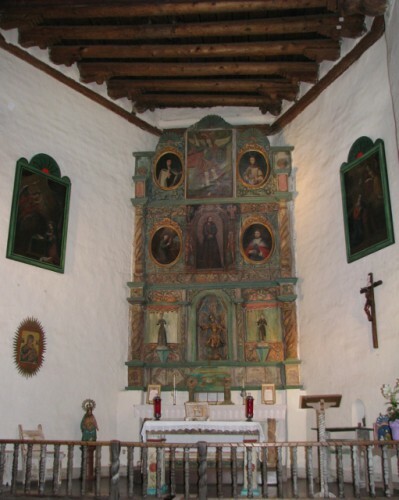 This mission is reputed to be the oldest church in the United States, built between approximately 1610 and 1626 by the Tlaxcala Indians under the direction of Franciscan Friars. It has seen a lot over 400 years. After it was constructed and served the Spanish for several years, it was taken over by the Indians during the Pueblo revolt in 1680. They revolted over the poor treatment they had received since the Spanish had arrived and tried to convert them all to Christianity. Oh yeah, and there was that little detail about the forced labor for the the mission system too – including the construction of the San Miguel Mission. 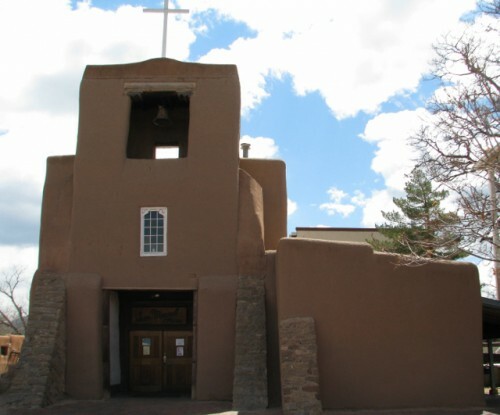 During the revolt, the Puebloan people took over the mission and killed over half of monks. The mission was heavily damaged as the Indians tried to destroy all signs and symbols of Christianity. In all, 400 Spaniards were killed during the revolt and the remaining 2,000 were driven from the area. The revolt lasted for 12 years before the Spanish retook the area in 1692 and rebuilt the mission. All that remains now is the chapel; all the outbuildings and walls that existed during its time as a working mission are long gone. For a mere $1 admission fee (additional donations are welcomed), you can see the mission chapel and ring the original bell. When they were restoring the mission, they left some of the original features exposed with cutouts covered with plexi-glass. You can see the original adobe construction on the walls and underneath the current floor. They show where and when renovations occurred, and they also indicate where they found a date carved into one of the old ceiling beams. It is amazing to think of how much history this old church has seen. After seeing the trifecta of interesting historic sites (and it wasn’t even noon! ), Jon wanted to just wander around the downtown area and see more. We checked out the outside of the current New Mexico State capitol building, with its many outdoor sculptures. The capitol building was built in 1966. We found a cute little shopping mall in a historic building, but neither of us was really in the mood to shop. And we found a guy catcalling to us from the sidewalk, clearly trying to woo us, but we had no idea why. 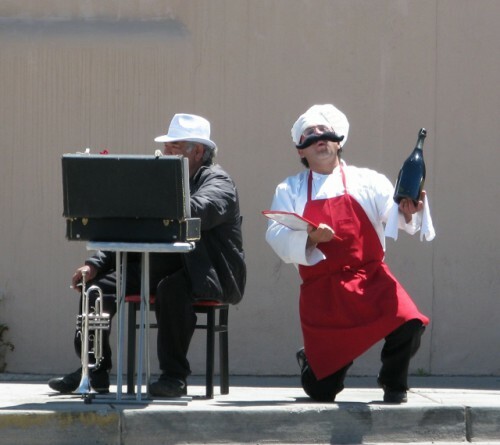 I don’t know if there was a restaurant nearby… But he was pretty entertaining. I have no idea what this was about! We decided we were hungry, so we tried wandering closer to the historic section to find a restaurant, but couldn’t really find anything outside of the immediate downtown core. We finally asked a nice gentleman, and he sent us in search of Tia Sophia’s southwest restaurant. We looked and looked where we thought he had told us it was, without finding it. We had given up and were in search of any old restaurant when we finally spotted a tiny little sign on the wall, with a small restaurant tucked in behind the door. It was Tia Sophia’s! 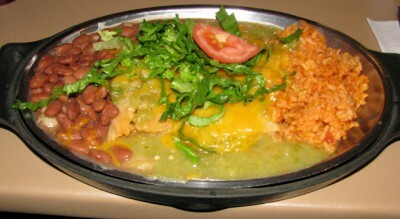 I had the tamales; Jon had the bean burrito – they both came with a choice of green or red chile sauce. Mine also came with rice and red beans. It was a delicious meal! 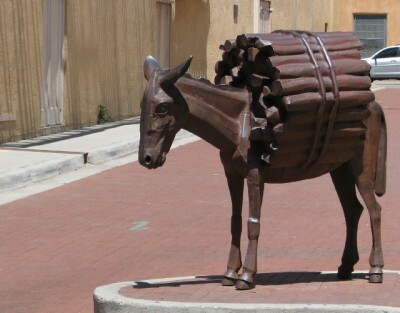 After leaving Tia Sophia’s we took some photos of the bronze burro statue at the end of Burro Alley. It was commissioned and placed there in 1988. Sadly, in mid-May, someone vandalized the burro, tagging it with graffiti and stealing its tail! The Arts Commission was able to have a replacement tail made to restore the statue in June, and the graffiti was able to be removed. But who does that!? We were having a wonderful day, and it wasn’t done yet! 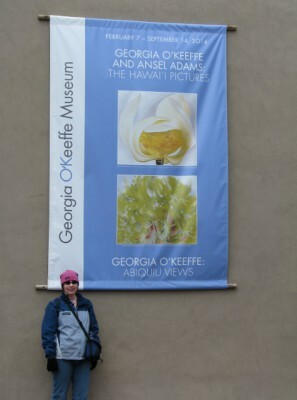 We were going to see the Georgia O’Keeffe Museum next! Have you been to the San Miguel Mission? How about Tia Sophia’s restaurant?